There is a white figurine next to the couch in the sitting room at Regina’s house. Is it The Little Mermaid? 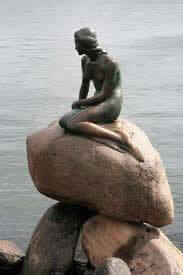 Here is the Little Mermaid seaside statue in Copenhagen. This entry was posted in Once Upon a Time Blog and tagged abc tv, copenhagen, disney, easter egg, once upon a time, regina mills, statue, storybrooke maine, the little mermaid, the mayor, tv series on November 25, 2011 by Admin of Storybrooke ;).